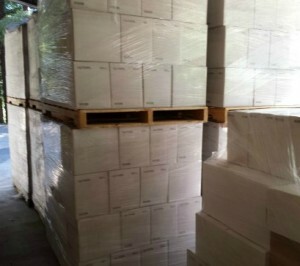 We spent the weekend getting the winery organized for our upcoming bottling extravaganza. If all goes as planned, we will bottle 1200 cases of Cabernet, Chardonnay, Merlot, and Pinot next weekend. A big thank you in advance to our winery helpers! After we finish bottling, we will be ready to receive this year’s harvest. The 2014 harvest is looking great. So far, it looks like the yields will be up and the quality will be top notch! “Happily, grapevines are well suited for dry farming so the drought has not been as problematic for our local vineyards as it is for growers who depend on regular watering for fruit orchards and other types of agriculture,” explains Villa del Monte winemaker Neil. In general, grapevines can thrive on as little as about 19 inches of water each year since the roots go so deep into the ground. “In the Summit Road area, we had measurable rain in late February and late March, and then we had a tiny bit of rain in late April,” according to Villa del Monte winemaker John who has a rain gauge at his house. Dry farming, which is the practice of relying on the root system to extract water in the soil from past rainstorms, works well in the Santa Cruz Mountains and surrounding areas since we typically get a decent amount of rainfall between November and April, the soil holds water well, and we get some moisture from the coastal fog. To be successful with dry farming, the grapevines need to be spaced appropriately so that each vine has approximately 70-100 square feet of space (think of a cubicle farm at a local Silicon Valley company). Grapevines also need to be planted on a rootstock that goes deep. Although it looks like the yields, that is the gross tonnage of grape clusters, will be on the normal to high side, the grapes themselves will be smaller with concentrated fruit flavors that are a byproduct of low water. 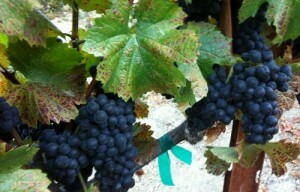 As a comparison, vineyards that require regular irrigation due to locations in the Central Valley and other water-challenged areas tend to produce plumper, juicier grapes with somewhat diluted flavors and aromas. We will be open for wine tasting from noon to 5 pm on August 30 and 31. If harvest has started, ask us for a peek inside the winery as you might have the chance to see and smell freshly crushed juice. Why do Wineries put Netting on the Grapevines?